Home Up in flames ! The article tells about a fire in a couple of hangers at the Buyskade in the western part of Amsterdam, the Netherlands. A total of 15 cars, amongst which a number of valuable classics were destroyed in the fire. The owner has promised to try and see if he could still locate the papers if they are not destroyed in the fire and relay the chassis number. 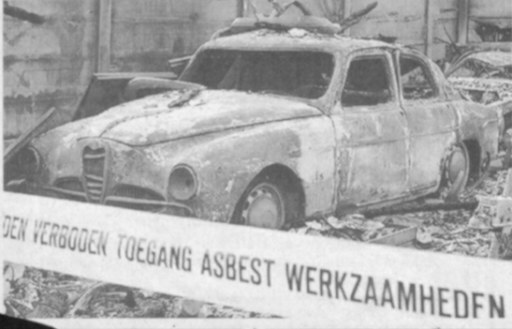 Since the roof of the hangars contained a reasonable amount of asbestos, the car wrecks were destroyed to avoid the danger of people getting contaminated with this deadly substance. 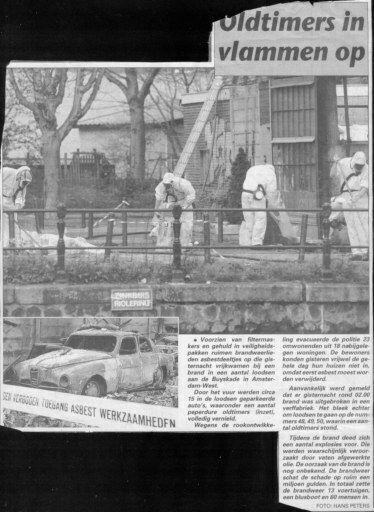 On the upper scan, I have enlarged the little picture which shows an Alfa Romeo 1900 Berlina and the wreck behind it should be the 1300 JZ.